U.S. President Barack Obama pledged to punish Russia for hacking of Democratic groups and figures during the election season with actions that’ll occur in secret and others that’ll be made public. “Our goal continues to be to send a clear message to Russia or others not to do this to us because we can do stuff to you,” Obama said in a press conference. Obama met Putin during a summit in China in September and told him to "cut it out" and or else "there would be some serious consequences if he didn't," he said. After that meeting, the hacking attempts stopped but Wikileaks had already been given copies of stolen documents. Obama is vowing action against Russia when incoming president Donald Trump likely won’t. Trump has instead dismissed claims that the Russian government interfered with the U.S. election to help him win. Nevertheless, the Obama administration has ordered U.S. intelligence agencies to provide a report reviewing Russia’s alleged role in the election interference. The President intends to make as much of that report public as possible. On Friday, reports said the FBI is siding with the CIA and has concluded Russia attempted to influence the U.S. election to help Trump win. 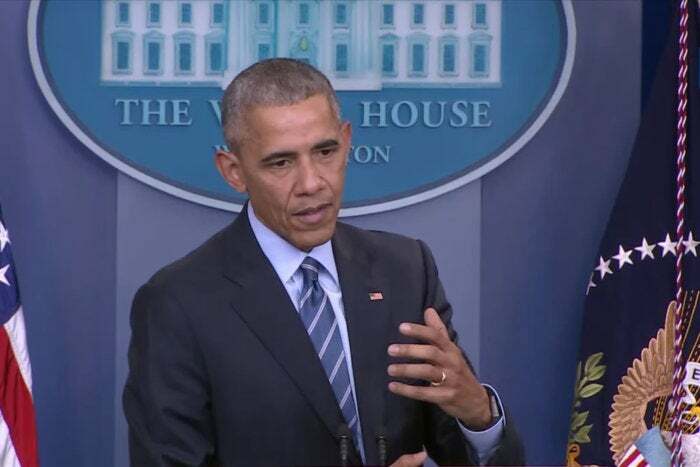 Obama said he want to avoid avoid politicizing the findings and hopes that Trump will share concern over the Kremlin’s effort to influence the election. “What we've simply said is the facts,” Obama said. However, the Russian government has continually denied any involvement. “They should either stop talking about that or produce some proof at last. Otherwise it all begins to look unseemly,” said the government’s presidential spokesman Dmitry Peskov on Friday, according to a Russian state news agency. On Thursday, Trump’s former rival in the presidential race, Hillary Clinton, blamed her defeat partly on Putin’s efforts to undermine her candidacy with the cyber meddling. During presidential race, the Democratic National Committee and a Clinton campaign chairman, were hacked, resulting in sensitive emails being leaked to the public. Two years ago, Obama faced another major hacking incident, this one involving a massive breach at Sony that was blamed on North Korea. To retaliate, the U.S. authorized additional economic sanctions against the country that targeted 10 North Koreans and its arms industry. The U.S. may have also been responsible for an internet outage that occurred in the country. Sanctions, legal indictments and cyberattacks are possible options, but they may not be strong enough to punish Russia, cybersecurity experts say. “We never had good responses to begin with,” said John Bambenek, a malware researcher with Fidelis Cybersecurity. On Friday, Obama said the U.S. will take a “thoughtful, methodical” approach, but he acknowledged that his government already has issued tough economic sanctions against Russia over the conflict involving the Crimean Peninsula. He also only has about a month left before he leaves office.